Charavarthy starts off with a standard storyline where there are the customary good-hearted villagers living under the tyranny of a wicked village president and his sleazy side-kick. Chiranjeevi is the rather rough and ready villager with a heart of gold who stands up to the president and fights against the various injustices he sees in the village. So far so good, (although rather routine and not too exciting). Definitely well worth the Rs35 I paid for the VCD! 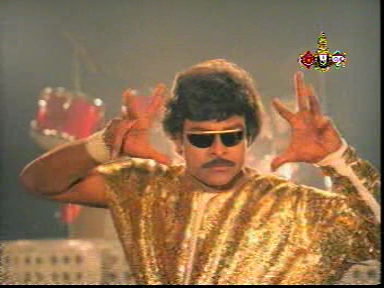 Sadly the rest of the film doesn’t quite live up to the expectations generated by watching Chiru dance in gold lame and black pleather, but there are still plenty of good songs, plus Chiru in a variety of dapper suits and bow ties – so I’m definitely calling it a good buy. 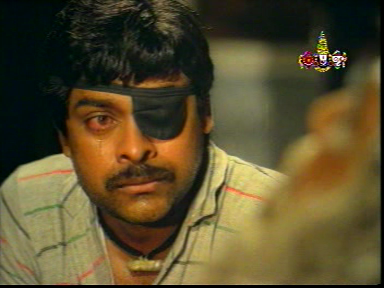 Chiranjeevi is Anji, a simple man who lives in the village and helps the local Swamiji (Somayajulu J.V.) look after a number of orphans. Swamiji runs a school at his ashram where the orphans also live, but it’s under threat from the village president (Satyanarayana Kaikala) who wants the land for himself. The president threatens and blusters, but Anji isn’t going to let anyone bully the gentle Swamiji and when the president’s thugs turn up at the school to throw the kids out (literally! ), Anji makes sure that they are the ones forced to leave. Anji is also intent on making the best match for his sister, who is back in the village after completing her studies. The scene where Anji meets up with her again is brilliant, although I’m not sure why he should be so shy and bashful on meeting his own sister. Maybe it’s just because his clothes are several sizes too small, but at least he’s made the effort to dress up for the occasion. Despite the self-conscious nature of their meeting, Anji is soon trying to get Lakshmi (Ramya Krishnan) to marry his best mate, and the local police sergeant, Mohan (Mohan Babu). 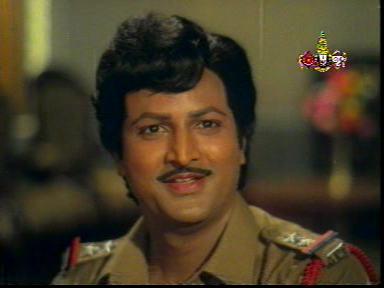 Mohan Babu hams it up nicely for the camera here and does his best to be the overall good guy in the film, with mixed success. Still it’s probably only natural that Lakshmi prefers her rich former class mate who has plenty of style, even if it is all wasted posing on the golf course. Anji is doing his own fair share of romancing, as he chases after the feisty Rani (Bhanupriya). Although the two seem to spend most of their time arguing or at the very least teasing each other,there are some night-time shenanigans which result in this great song. 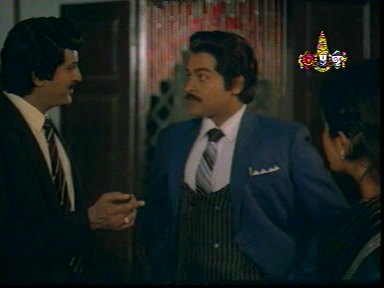 Bhanupriya is lovely here and she just sparkles in the scenes with Chiranjeevi. They both frequently look as if they are about to crack up laughing at each other and the camaraderie between them ensures some great chemistry as they veer between fighting and making up, usually both at the same time. However the president has more evil plans afoot and Anji ends up losing an eye as he saves the ashram yet again, leaving him with an eye patch and a generally bad attitude. 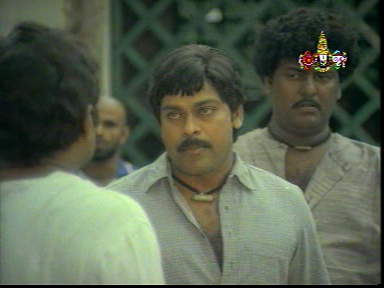 He picks a fight with Lakshmi’s rich suitor (Sudhakar) who is later found dead, sparking a hunt for the murderer. Since the fight with Anji was seen by everyone on the golf course, Anji is the obvious suspect, and Mohan is the man charged with bringing his friend to justice. There is much drama and scenery chewing as Mohan and Anji head for a show-down while Rani and Swamiji try to deal with the fall-out. 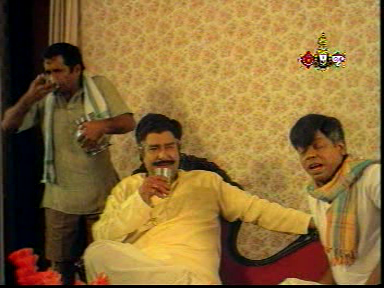 The president’s servant is played by a young Brahmi, and he provides a large proportion of the comedy, along with Allu Ramalingayya as Rani’s quack doctor father. It’s worth keeping an eye on the various support actors in the background too, as below where the servant who brings the president his drink, totally unnoticed, helps himself to a glass as well. That brings us to the re-incarnation of Anji as Chakravarthy, the famous disco dancer, who returns to his village presumably to clear his name and sort out the village president once and for all. And if he’s lucky hook up with Rani again too. Chakravarthy is as far removed from Anji as it is possible to be. He is suave and sophisticated, dresses in smart suits and talks in English as he schmoozes the villagers. 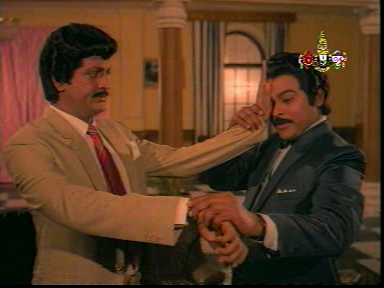 Mohan suspects Chakravarthy may be Anji, possibly due to the uncanny resemblance between the two, but is thrown off when Chakravarthy demonstrates that he has full use of his left eye. It’s a conundrum! I’m not sure if the two functioning eyes is ever explained, but it doesn’t really matter since there are more fights, more drama and suspicious looks exchanged before the final big showdown to grab our attention. There are also more of K. Chakravarthy’s excellent songs. I couldn’t decide which to add in here, but decided to go with this as Bhanupriya gets to wear much more tasteful outfits than in a few of the others. 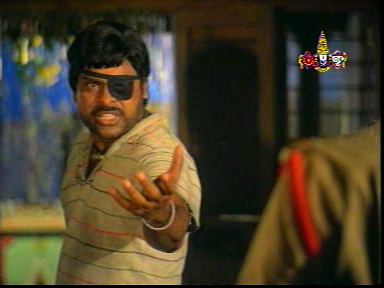 Needless to say, Chiranjeevi looks perfectly styled in every one! Although the film is overall a fairly standard masala flick, director Ravi Raja Pinisetty has added a few touches that bring originality into the mix. 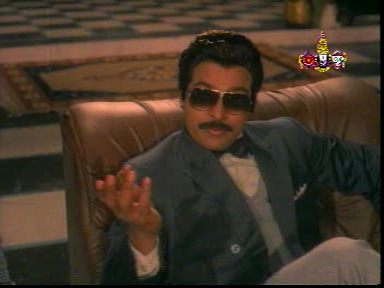 Since he later directed one of my favourite Chiru films, Yamudiki Mogudu, I was a little disappointed that he kept the flamboyance to a minimum in Chakravarthy, apart from disco dancer Chakrvarthy’s introduction number. But the more restrained costumes and comedy suit the overall style of the film. What I do like are the different dynamics in Anji’s relationships with his mentor, his lover and his best friend. The sudden shift when he reappears as Chakravarthy is also well envisaged, although I really did miss the subtitles that might have explained where he got all of his sudden sophistication. And the eye fixed up! Chakravarthy is definitely worth a watch for the chemistry between Chiranjeevi and Bhanupriya and for the concept of a disco dancer being the only person able to save the day! 3 ½ stars. This entry was posted in Tollywood and tagged Adventures without subtitles, Bhanupriya, Brahmi!, Chakravarthy, Chiranjeevi, K. Chakravarthy, Kaikala Satyanarayana, Megabirthday 2013, Mohan Babu, Ramya Krishnan, Ravi Raja Pinisetty, Somayajulu J. V., Telugu. Bookmark the permalink.